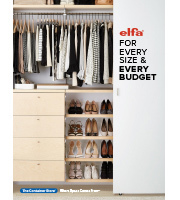 Whether you're paying bills, searching recipes or keeping up with your social networks, our exclusive Elfa shelving and drawer system keeps you organized. Available only at The Container Store, this exclusive Driftwood & Platinum Elfa Deluxe Home Office turns an alcove into a workspace, but it's just as home on any other wall. The Solid Shelves hold books, art and periordicals with ease. Plus, they easily adjust to make rearranging your space a breeze. An Elfa Utility Board combined with our Elfa Utility Shelves, Boxes and Hooks creates a sophisticated, functional update on the classic pegboard system. This solution is designed for a wall at least 6' wide. If this doesn't describe your space, please contact us so we can design the perfect solution for you with our free service! Driftwood & Platinum Elfa Deluxe Office is rated 5.0 out of 5 by 5. Rated 5 out of 5 by Lucyg from Love, Love, Love it! I still can't believe it - my Elfa system looks great!. The design team did a great job designing my room and all I provided were the measurements. Everytime, I walk into my new office/craft room I think it's the most beautiful and organized room in the house. I promise you'll love it too. It has given me a sense of order and peace...priceless! The kit says the system is 72&quot; wide, but if you add up the three shelf lengths, 24&quot; + 25&quot; + 25&quot;, that totals 74&quot;. What is the actual total width? The driftwood shelving is designed to overhang the mounting brackets slightly, which is why you're seeing a number discrepency. The system is designed to fit on a 72'' wide wall. If you would like assistance with a design, please feel free to call our Customer Solutions department, or LiveChat with us. Is there an option with the 84&quot; standards? Modern houses have 9ft ceilings and the 60&quot; would be way too short. Priced individually this would cost more than $1500. Yes! Our elfa Office can be tailored to your space and your style by one of our expert elfa Planners. And the design and consultation is always absolutely free! Just give us a call at 1-888-CONTAIN (266-8246) or visit us any one of our store locations and get started today. Does this come in Driftwood &amp; white? Yes, we can customize this elfa space to your preferred color and the measurements of your space. Please contact our Customer Solutions Department at 1-800-733-3532 for assistance with your free custom elfa design. Can I swap out the driftwood and get white for the same price? Yes, all elfa components are available open stock and can be completely personalized to suit your style and needs. Contact one of our expert elfa Space Planners today for your free, customized plan at 1-888-CONTAIN (266-8246). What is the width of the desktop? The worksurface of our Driftwood &amp; Platinum Elfa Deluxe Office is comprised of two 20&quot; deep x 25&quot; wide x 3/4&quot; high Elfa Driftwood End Shelves and one 20&quot; deep x 24&quot; wide x 3/4&quot; high Elfa Driftwood Center Shelf.